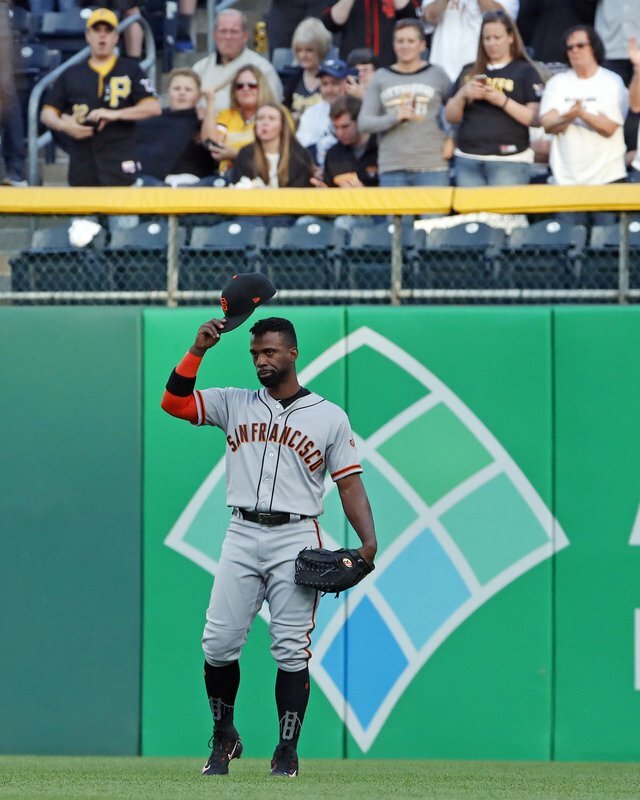 PITTSBURGH (AP) — For the first time in months, Andrew McCutchen woke up Friday morning in his own bed. He and his wife Maria took their infant son Steel to the doctor for some shots. For lunch, he stopped by his favorite pizza spot, and then he hopped in a car and drove to PNC Park, where he made his way through the players’ entrance and started the long walk toward the Pittsburgh Pirates’ clubhouse. Only this time, instead of breezing past the visitors’ clubhouse as he did during his more than eight years serving as the fulcrum around which the franchise spun from irrelevance into contention, McCutchen turned left and joined the rest of the San Francisco Giants, where his familiar No. 22 jersey hung in an unfamiliar spot. The five-time All-Star outfielder and 2013 National League MVP knew this day was coming the moment the Pirates traded him to the Giants in mid-January. And when it arrived, he didn’t exactly run from it. That’s never been his way. This is the same player, after all, who signed a six-year contract extension before the 2012 season even though the Pirates had gone nearly two decades without a winning season. He bet on himself and the organization, then became the face of a franchise that reached the playoffs each year from 2013-15. Still, it didn’t last. With an extension unlikely, Pittsburgh sent him west in mid-January for reliever Kyle Crick, outfield prospect Bryan Reynolds and international bonus slot money. The player team owner Bob Nutting repeatedly said would be a “Pirate for life” instead now works on the other side of the country, where he came in hitting .250 with three home runs and 14 RBIs. Asked if he felt a twinge of remorse over his departure, the 31-year-old shrugged. That challenge included the range of emotions he anticipated running back onto the field where he won a Gold Glove and helped reconnect a city with its baseball team. He didn’t expect his feelings to get the best of him, and if they did, so what? There were no tears when McCutchen stepped in against Jameson Taillon in the top of the first, just the smile that electrified so many for so long. The closest thing to a sellout crowd the Pirates have had all season rose to its feet when McCutchen emerged from the on-deck circle and launched into a loud, rolling ovation that lasted nearly a minute. He took his helmet off to soak it in while chants of “MVP” rained from the upper deck. A video tribute stuffed with McCutchen highlights between the top and bottom of the first followed while its subject watched from right field as a “Thank You” flashed on the electronic scoreboard behind him. He’s not a Pirate anymore. Yet he will remain a Pittsburgher. The McCutchens don’t plan to move out of the area. His wife grew up in DuBois, about two hours northeast of the city. “This is where we’re going to live regardless of baseball,” he said. His professional departure left fans frustrated even if the early returns make it appear it was best for all involved. On the night Pittsburgh traded its most important player since Barry Bonds left town as a free agent a quarter-century ago, Pirates general manager Neal Huntington said the decision to trade McCutchen didn’t affect the team’s ability to reach the World Series. Pittsburgh has been of the biggest surprises in the majors over the first quarter of the season, entering play Friday night in a four-team mix in the NL Central with St. Louis, Chicago and Milwaukee. Outfielder Corey Dickerson, acquired in a trade with Tampa Bay a month after McCutchen was dealt, has fit in nicely in left alongside Starling Marte and Gregory Polanco. And McCutchen has been keeping tabs. That’s rarely been an issue in San Francisco, which has won three World Series since 2010. McCutchen isn’t required to be anything more than the everyday right fielder for the Giants, and he’s focused on the future.